Electromagnetic force permeates our planet. In essence, Earth itself acts like a giant spherical magnet. This is caused primarily by the motion of electrical currents within Earth, probably through the liquid metallic part of Earth’s core. Combined with Earth’s rotation, the core acts like an electric dynamo, or generator, creating a magnetic field. 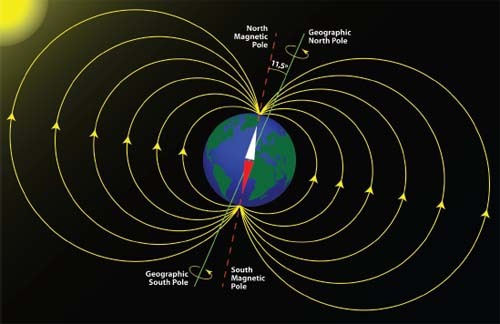 An illustration of the magnetic field surrounding Earth also shows the disparity between the magnetic poles and geographical poles.